Nothing makes me want to read a non-fiction book more than this sort of quote on the back cover “Gross! We’re all descended from green slime. Find out all about it inside.” Actually, this is a much more sophisticated book than the strapline implies. Covering basic earth information, such as how the world came about, how the seasons work, planets, gravity, day and night, evolution, the beginning of life, earth’s plates, the water cycle, weather, carbon, the sea…the list goes on. Yet unlike typical encyclopedias this book sets out the information in graphic and interactive illustrations so that for example, you can open a cheeseburger to see where all the constituent ingredients come from. The water cycle pops out the page, a carbon footprint is a footprint, and the food chain reveals itself in a pop up diagram. Not only is the text clear and simple, but also poses many questions to the inquisitive reader…how do you think our actions affect the natural water cycle? A joy to look at, read, and a fabulous start to explaining the ‘big picture’ of our world. 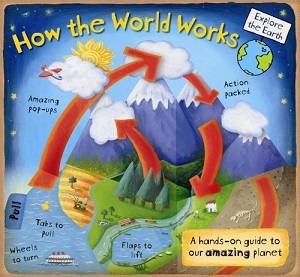 This won the Royal Society Young People’s Book Prize in 2011, and Christiane Dorion has since published How the Weather Works, How We Make Stuff, How Animals Live, and in September 2014, How the World Began, which is an exploration of history from the big bang (covered in greater detail than in How the World Works) through ancient civilizations to the future of the earth. Good visual reference for ages seven and up.